Director – Zack Snyder, Screenplay – Chris Terrio & Joss Whedon, Story – Zack Snyder & Chris Terrio, Producers – Jon Berg, Geoff Johns, Charles Roven & Deborah Snyder, Photography (3D) – Fabian Wagner, Music – Danny Elfman, Visual Effects Supervisor – John ‘DJ’ Desjardin, Visual Effects – Double Negative (Supervisor – Tom Proctor), Method Studios (Supervisor – Sean Leonard), MPC (Supervisor – Seth Maury), Pixomondo, Rodeo FX, Scanline VFX (Supervisor – Bryan Hirota), Shade VFX LLC, Teamworks Digital, Vitality Visual Effects, Weta Digital Limited (Supervisor – Keith F. Miller, Animation Supervisor – Simeon Duncombe), Special Effects Supervisor – Mark Holt, Production Design – Patrick Tatopoulos. Production Company – Warner Brothers/Ratpac-Dune Entertainment/Atlas Entertainment/Cruel and Unusual Productions. In the aftermath of the death of Superman, Batman starts searching the world to build a team of those with superpowers to fight alongside himself and Wonder Woman against the looming invasion. These include Barry Allen, a nerdy teenager who can move with incredible speed after being struck by lightning and operates as The Flash. Bruce travels to Iceland in search of Arthur Curry, nicknamed Aquaman, who lives underwater and can control watery elements, but he wants nothing to do with the human world. They are also followed by Ray Stone, who has been transformed into a cyborg after contact with an alien object in his father’s laboratory and has the ability to access and control technology. Wonder Woman reveals that the object is one of the Mother Boxes, a powerful artefact that was split in three after an ancient battle in which the Amazons, Atlanteans and humans repelled a destroyer of words known as Steppenwolf. Steppenwolf has now returned and forcibly takes the Mother Boxes that are guarded in Themyscira and Atlantis. Fearing that they are not enough to fight off Steppenwolf and his parademons, Bruce takes the risky move of using the third Mother Box to try and revive Superman from the dead. Unless anyone has been living in the a mud hut for the last ten years, the cinematic box-office has been dominated by Marvel Comics with Iron Man (2008), Thor (2011), Captain America: The First Avenger (2011), The Avengers (2012) et al. DC Comics, Marvel’s rival on the comic-book page, though best positioned to do so and even being owner by a film studio (Warner Brothers), have been slow to the party in terms of following suit. Aside from Christopher Nolan’s trilogy – Batman Begins (2005), The Dark Knight (2008) and The Dark Knight Rises (2012) – and non-starters like Superman Returns (2006), Jonah Hex (2010) and Green Lantern (2011), it took DC until Man of Steel (2013) to start imitating Marvel’s game. Man of Steel launched what has been termed the DCEU (DC Extended Universe) and in short course was followed by Batman V Superman: Dawn of Justice (2016), Suicide Squad (2016), Wonder Woman (2017), Justice League here and the subsequent Aquaman (2018) and Shazam! (2019), with other titles slated. The DCEU feels like a forced attempt to catch up with what Marvel have been doing. Various companies made a host of Marvel adaptations for ten years from Blade (1998) onwards before Marvel had the idea of including a post-credits sequence in Iron Man. This created a great buzz and more followed in quick course. The important difference though was that other companies had laid the ground before Marvel Studios came to the party, whereupon they teased the Marvel Cinematic Universe through five films before eventually uniting their characters in The Avengers. In retrospect, it looks like a smart pre-planned scheme but without the groundwork laid by the preceding films it wouldn’t have happened – even the studio has some doubts about being able to pull off such an ambitious plan. In the wake of Marvel’s success, other studios attempted to launch shared universes – the Dark Universe based on Universal’s Famous Monsters or Sony’s attempts to build something with Spider-Man – with fitful results. DC has made the assumption that everyone wants shared universes off the bat, rather than a bunch of individual superhero films that lay the ground and introduce the characters before eventually uniting together, and have launched into their shared world after only a single film. The Justice League of America, as it was then called, first appeared in 1960, gaining their own title some months later the same year. They weren’t (as is being misreported) the first DC superhero team – DC had created that with the Justice Society of America among its Golden Age heroes back in 1940 (which were then retired to Earth 2 with the advent of the Justice League). Despite going through a number of reboots, line-up changes and losing the America on the end of their name, the Justice League has remained in print until this day. (See bottom of page for the other Justice League film and tv versions). A live-action film Justice League: Mortal was planned in the mid-2000s under Mad Max director George Miller and a cast line-up was announced before the project was shut down by the 2008 writer’s strike. Immediately after the release of Batman V Superman, the idea of a Justice League film was revived again, although the initial plan was that this would be a two-part film under which this film would have been titled Justice League Part One. The film was subject to considerable production problems, not the least of which was that director Zack Snyder stood down after shooting due to the suicide of his daughter. Joss Whedon, the director of the first two The Avengers films, stepped in to direct uncredited reshoots (he only retains co-writer’s credit on the finished film). Justice League opened to very mixed reviews and less box-office than had been expected of it. So how does the result shape up? Both Batman and Wonder Woman get pre-credits sequences showing them tackling everyday villains. Batman’s is on the less interesting side – although does have the amusement of featuring Holt McCallany, who has become an instantly recognisable face as the result of tv’s Mindhunter (2017– ), as an uncredited burglar. 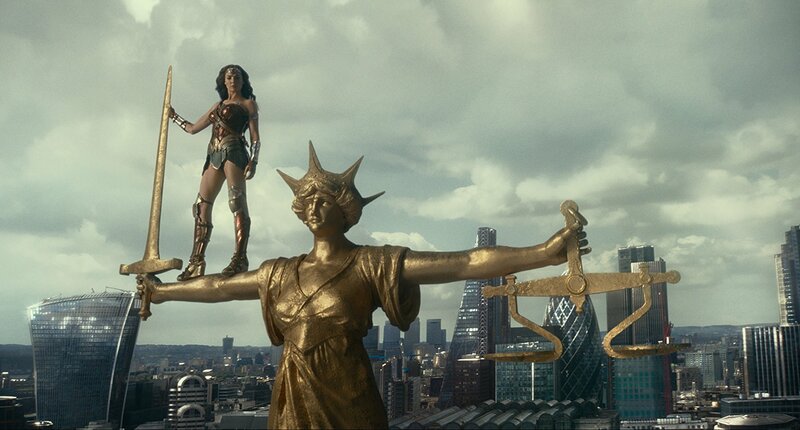 Far better is the appearance of Gal Gadot in a triumphant sequence where she bursts in and saves hostages as a terrorist group threaten to detonate a bomb in a bank. 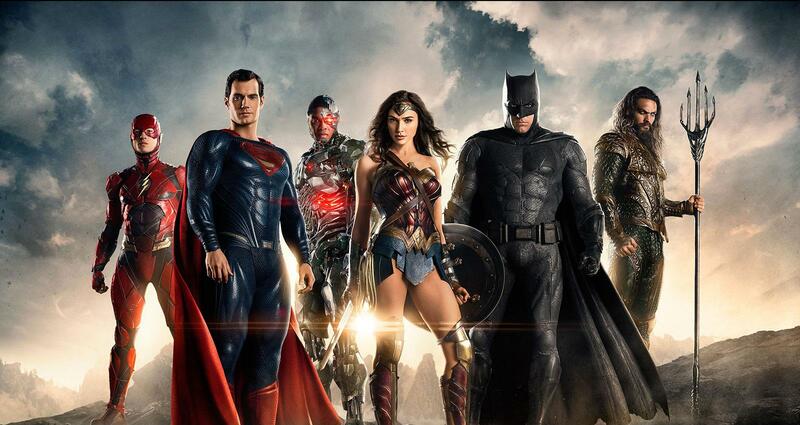 With Superman off stage for much of the show, Batman and Wonder Woman become the central figures of Justice League. Gal Gadot becomes the heart of the show, offering empathy and a winning smile. Ben Affleck makes for a far more heroic Batman than we are used to seeing on the screen. Rather than the troubled loner who stays in the shadows, he becomes the authoritative voice of the team, makes the big leadership decisions, and even hosts the Justice League in the Batcave and prepares to turn Wayne Manor into the Justice League headquarters at the end of the show. Affleck even gives Batman a sense of humour – lines like “What’s your superpower?” “I’m rich” or “I brought the bank” – that are not something you usually associate with the modern Batman. To Justice League‘s credit, it does develop a strong story arc continuing on from what was laid down in Dawn of Justice. The recruitment of all the various members works well. The stickler in me kind of wished that they had gone with the original League line-up from back in 1960 – Superman, Batman, Wonder Woman, The Flash and Aquaman along with Green Lantern and J’onn J’onnz, the Martian Manhunter. Green Lantern is sort of off the table due to the flop of the Ryan Reynolds movie – although DC keep making moves about reintroducing him with the announced Green Lantern Corps (2020), while the flashback scenes to the original Steppenwolf invasion clearly show a Green Lantern fighting alongside. Martian Manhunter is sort of off doing duty at the moment in tv’s Supergirl (2014– ) as played by David Harewood. It feels as though Zack Snyder has determined to write his own imprint on the DC Comics characters as opposed to simply adapting them. In the Snyder-verse, both Batman and Superman come out in distinctive ways that are different to their comic-book counterparts – Superman in an open relationship with Lois Lane and the almost complete sidelining of Clark Kent; the Batcave hidden beneath a lake (you cannot help but wonder why the Batcave isn’t flooded as Alfred stands waving goodbye to the Batplane while the waters pour down around him); the casual and pointless killing of Jimmy Olsen. I mention the changes to The Flash in the section below, none of which I think offer a substantial improvement to the character as opposed to the far more likeable Grant Gustin incarnation of The Flash that we have on tv at the moment in The Flash (2014– ). The version of Cyborg is fairly close to the one that features in DC’s The New 52 reboot from 2011 onwards, especially the explanation of his origin as a result of Mother Box technologies. The most radical of the changes is Aquaman. Aquaman has been around since 1941 and featured both in his own comics and as a member of the Justice League. For rightly or wrongly, Aquaman has become considered a joke – as witness several episodes of Entourage (2004-11) that made an ongoing joke out of a James Cameron-directed film version starring Adrian Grenier. Mostly the joke seems to centre around how the specificity of Aquaman’s powers – as related to water and oceans – makes him weak for anything outside of that environment. There is even a trope at TV Tropes devoted to this This Looks Like a Job for Aquaman. Zack Snyder has determined to throw everything we usually associate with Aquaman out the window and reconceive him as a badass. In every other incarnation, Aquaman is always Caucasian with blonde hair (and often a beard) and wears a yellow and green costume. All of that goes out and we get the Hawaiian native Jason Momoa cast in the role, giving us a dark haired and olive-skinned Aquaman. This Aquaman gets his trident but his traditional costume has been swapped for an impressive set of battle armour (that you cannot help but think gives him a lot of problems swimming). Momoa plays Aquaman as an individualist loner who wants nothing to do with humanity for much of the film before eventually coming around. The MCU has had the smarts to place everything it holds in its copyright aegis under a careful and well-controlled creative eye that maintains a scrupulous continuity. All of their films and tv series thread together into the same universe – even the grittier Daredevil/Jessica Jones/Luke Cage/Defenders shows are making reference back to the main films. On the other hand, DC has been happy to throw whatever someone pitches to them out there in the hope something will stick. Look at the amount of projects that they have okayed in the last two years with Aquaman, Cyborg, Shazam, Green Lantern, Batman, Batgirl, Nightwing, Harley Quinn, Black Adam, Gotham City Sirens and Justice League Dark films, as well as a Joker origin story, all purportedly in the works, not to mention sequels to all of the released films – many of which quite clearly will contradict continuity. The question among this is which is the real DC universe? This is no more evident than the fact that we currently have two competing versions of The Flash on screen with Ezra Miller here and Grant Gustin in tv’s The Flash. 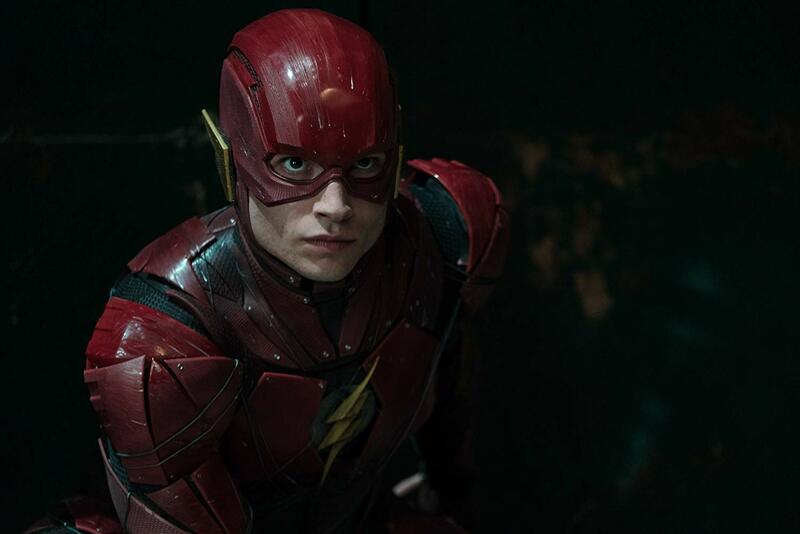 Zack Snyder has made a point of creating a very different version of The Flash to the tv one – though both actors are only two years apart in age, Ezra Miller is made to seem only about the age of twenty and only just gets his crime lab job at the end of the film. Furthermore, both characters are quite different – Ezra Miller’s Flash is nerdy and socially ill-adept, while Grant Gustin’s Flash is a more charismatic and self-assured team leader. Miller’s red suit is designed as a series of chitinous pieces of armour plating that make him more like an insect and surely looks rather awkward to wear. And while Gustin’s Flash demonstrates the red blur we are all familiar with in the comic-books, Snyder gives us the effect of Miller being surrounded by lightning whenever he moves. It should also be noted that what’s been termed the Arrowverse (the interconnected continuity between the various Flash, Green Arrow and Supergirl tv series) also features its own version of Superman (Tyler Hoechlin) who appears in the alternate version of the Krypton saga in Supergirl. And of course all of these are completely different to the various incarnations of the characters that appear in the DC Universe Original Animated Movies (see below). Not to mention that with the announcement of a Flashpoint Paradox film, we are going to get presumably yet another continuity reset. To say there is a lot of hatred for Zack Snyder out there in the social media sphere is an understatement – the man even has people devising gifs and memes about him, as well as online petitions to have him removed from the DCEU. All of Synder’s other films have fans and detractors in varying degrees but the most contentious of them all is his take on the DC comics from Man of Steel through Dawn of Justice to Justice League. The crucial thing is that out there in the blogosphere there is almost nobody I am aware of who defends Snyder. Snyder’s take on DC superheroes seems to involve to wit:– massive, frequently excessive degrees of mass destruction; a dim and murky visual scheme that desaturates colours and renders the traditional costumes in muted tones; a heavy reliance on CGI characters and action scenes; a happiness to rewrite established DC continuity whenever he sees fit. I find the relentless dourness of the visual look tedious, while the emphasis on mass destruction reaches a point of overkill. The climactic battle between the League and Steppenwolf and parademons here slips into a blur of action and mass destruction where you simply switch off. On the other hand, I don’t think the Snyder-verse is entirely dismissible. What I get from looking back on Man of Steel, Dawn of Justice and Justice League as a completed story is that he has set out to build an epic arc about Superman’s relationship with the people of Earth as god-like saviour, pariah and rediscovery as a figure of hope. Which is certainly more exploration of Superman as a character than we have had in most of his other screen incarnations. I also look on the Snyder-verse as sort of a not-entirely-successful attempt to do what Frank Miller did in The Dark Knight Returns (1986) and Alan Moore in Watchmen (1986-7). That is to say, they took the wholesome cleancut DC superheroes of the Golden and Silver Ages and muddied the waters, especially in a moral sense. The Snyder-verse can be seen almost as the Frank Miller version of the Christopher Reeve Superman films. (That is if the Frank Miller take on Batman had not been used heavily by the Tim Burton and Christopher Nolan Batman films and others). 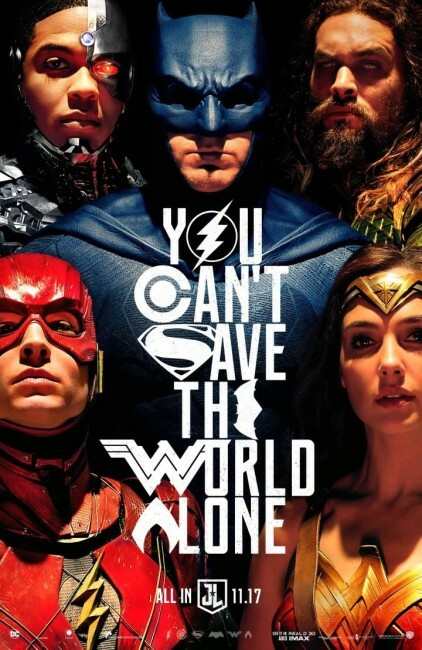 On the other hand, while an expensive indulgence of a very personal take for Zack Snyder, this is not an interpretation of DC Comics with which most people seem to be happy. Jack Kirby is a god to comic-books. His Fourth World saga is one of the greatest comic-books that DC ever produced. It is clear that Snyder wanted to introduce elements of the Fourth World saga, which would presumably have led up to the Justice League battling Darkseid. 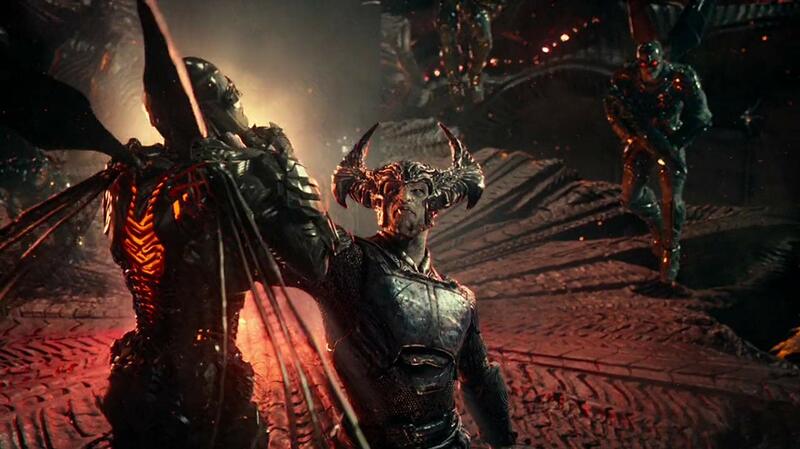 To this extent, the villain of Justice League is Darkseid’s lieutenant Steppenwolf. The problem with this is that Steppenwolf is only a minor character in Kirby’s comics and was never designated with the Destroyer of Worlds epithet until DC’s The New 52 reboot in 2011. The other thing is that the Steppenwolf we have is an awfully generic super-villain. The CGI renders him as anonymous – he looks for all the world like one of the dark elves from Thor: The Dark World (2013) – and there is nothing in the performance that does anything that makes him stand out. Another crucial element of Kirby’s Fourth World was Mother Box. In Fourth Word/DC continuity, Mother Boxes have always been the superheroic equivalent of smartphones, mystically tied to the New Gods (to the extent they die when they do), aiding them and providing information in a variety of capacities. Here they become generic superheroic McGuffins – all-powerful artefacts that have the unspecified ability to destroy the world and need to be reunited after millennia of being separated so that can Steppenwolf can destroy the world yada yada. Zack Snyder’s other films include:- the remake of Dawn of the Dead (2004); 300 (2007) based on Frank Miller’s graphic novel about the Greek wars; the adaptation of Alan Moore’s classic superhero graphic novel Watchmen (2009); the animated owl fantasy Legend of the Guardians: The Owls of Ga’Hoole (2010) and Sucker Punch (2011) about a young girl’s imagined alternate reality. Snyder also wrote/produced 300: Rise of an Empire (2014) and produced Suicide Squad (2016), Wonder Woman (2017) and Aquaman (2018). The Justice League first appeared on screen in the painfully bad tv pilot Justice League of America (1997) that never went to series. They was far more successfully incarnated as the animated tv series Justice League/Justice League Unlimited (2001-6) from producer Bruce W. Timm who had a number of noted successes adapting DC superhero properties to the small screen throughout the 1990s and 00s. Following this, the Justice League were spun off in a series of animated films with Justice League: The New Frontier (2008), Justice League: Crisis on Two Earths (2010), Justice League: Doom (2012), Justice League: The Flashpoint Paradox (2013), Justice League: War (2014), Justice League: Throne of Atlantis (2015), Justice League: Gods and Monsters (2015), Justice League vs Teen Titans (2016) and Justice League Dark (2017).